Hardy, disease resistant fruit and nuts from Mark Shepard. Nuts are great to eat, and super healthy for you, but they are also a great crop for so many other reasons. Whether you have a small yard or have access to many acres of land, I want you to consider getting some of these awesome nut trees that we’re importing from Wisconsin from one of the master permaculturists and nut breeders in the world: Mark Shepard. In spring 2017, Artemisia’s Forest Garden Nursery, that’s me, Rob Read, and my friend and business partner Shantree Kacera of The Living Centre, are bringing in some of Mark’s awesome trees. We’re opening up sales of both bulk packs of 25 trees and single trees now with a warning - these won’t last long, and we probably can’t get more. This is the first year we’ve been able to get Mark’s famous chestnuts and nut pines into the province - and we’re the only place selling them. Mark is selling out every year, and we had to order these pretty much a full year ahead to successfully get them. Right up front, here’s the deal: If you pre-order 100 trees between now and December 31 for pick-up in Spring 2017, you get $120 off. That’s like getting 12 trees free. only until December 31, 2016! Click here if you already know you want to buy nut trees with this amazing deal right now. Or read on, to learn more about these incredible nut trees! They say money doesn’t grow on trees, but nuts do - and you can sell nuts … for money. 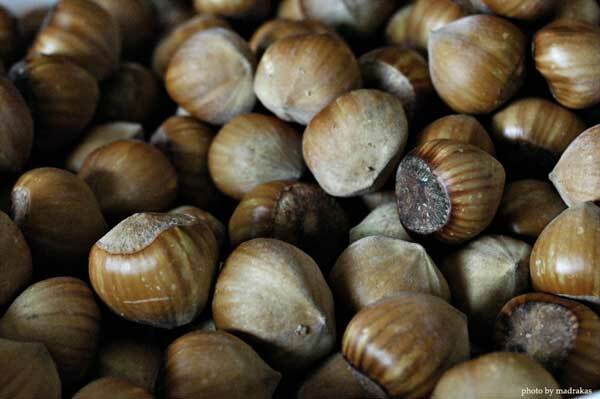 Mark describes chestnuts and hazelnuts as the future of farming in North America. Chestnuts have a similar nutritional profile to corn, and hazels have a similar nutritional profile to soybeans. Those two crops make up the majority (along with wheat) of field cash crops in Ontario. Imagine if you only had to plant your crop once - and it kept producing more and more every year, and all you had to do was harvest. Imagine what a difference to the land it would make if you never had to plough a field again. So much less risk of erosion of our precious top soils. And with nut trees you get all kinds of bonus products other than the nuts themselves - wood for everything from walking sticks, to firewood, to shiitake mushroom logs. The province of Ontario has been pushing hazelnut production in response to the needs of Ferrero Rocher, who currently import hazelnuts from Turkey to make Nutella and candy in the province. While Ferrero might not be the best market for your hazelnuts, in my opinion, because they want very specific named varieties that don’t do well with Ontario winters, it’s clear the hazelnuts are an up and coming crop in Ontario. Whether you make premium dollars by marketing them at farmer’s markets or to up-scale bakeries, or want to go organic to make good money that way - or even if you just sell them on the open non-organic market - I just looked it up on amazon, and 1kg of hazelnuts was going for $20 (that’s about $10/lb) https://www.amazon.ca/Yupik-Hazelnuts-Shell-Filberts-1Kg/dp/B00NAU7X2K/ref=sr_1_2?ie=UTF8&qid=1478205826&sr=8-2&keywords=hazelnut - and that’s in-shell! These hazels from Mark have been selected for blight resistance and hardiness, among other things - learn more about what traits Mark selects for in the Chestnut section below. Competitive with weeds - Mark uses STUN as his management style with his trees: Sheer Total Utter Neglect. In other words - these trees are from parent stock that does well with almost no human intervention other than harvest. Fresh pine nuts close to home! While many pines have edible nuts (like those ones on your fancy salad, or ground up in the best quality pesto), these Korean Stone Pines have much larger nuts than what you’d find on our local conifers. What I like about them is they are great windbreak trees, that have the bonus of a high value crop. Pine nuts are another one of those premium crops that are super expensive at the store. Imagine bringing them to a local farmer’s market, or even getting them for sale in a health food store. You could even save the work of getting the seeds to someone else - sell the cones as novelty bird feed at a farmers market or craft show. A nice little extra side-crop from space that’s usually just doing its windbreak thing. That’s what permaculturists call stacking functions! Whether you’ve been thinking about this for years, or this is new to you - this is the time. I have a feeling these trees are going to pre-sell really fast. If you pre-order 100 trees between now and December 31 for pick-up in Spring 2017, you get $120 off. In future messages I’ll be getting into just how much income you can expect to make from these trees, and some ideas about the labour involved, and protecting your trees from varmints and other hazards. Oh yeah - and we also have listed all our other new items for Spring 2017 - so you can have a peak at those, and pre-order those as well.